Often the idea of a perfect holiday features a beautiful sunny beach with a cocktail in hand, but for many people a break from work and the daily routine means having time to follow their favorite activities, which are often overlooked during the daily life; if this sounds like you then you should not miss the dynamic holidays on the Amalfi Coast. If you like sports also during your break or simply do not like lazy holidays and prefer to feel involved in activities and guided tours then the holiday activity package on the Amalfi Coast could be just right for you. The Dynamic Package offered by the Hotel Aurora includes a selection of guided walking tours with local guides to discover the most enchanting places of the Amalfi Coast including Ravello, the Path of the Gods, Paper Mill Valley plus the historic centre of Amalfi without giving up the luxury and comfort of our hotel services, including a welcome drink with local wines and products, free Wi-Fi, in-room amenities on arrival like water, tea and coffee, and much more. The guided tour of Ravello is a tour of about 2 hours on foot, along a path of about 1 km that covers the historic city centre plus some of its magnificent monuments. The appointment is at 10:00 am in Piazza Vescovado, Ravello, at the bottom of the steps of the Cathedral of San Pantaleone. During the tour there will be a visit to the Duomo and to Villa Rufolo, whose there is an entrance fee. The visit to Villa Cimbrone is not included, which guests can visit independently. All participants must be confirmed the day before by 22:00. The walk Ravello-Atrani-Amalfi is a trek of about 3.4 km that allows you to walk to Amalfi in about 2 hours. The path is almost totally downhill and passes along an ancient stone staircase, with short stretches of dirt road. Therefore comfortable walking shoes and a good fitness level are necessary. The appointment is at 16:00 in Piazza Vescovado, Ravello, at the foot of the Cathedral’s steps. The walk goes through the localities of Torello and Atrani, passing through the panoramic lemon terraces of the Amalfi Coast. Reservations must be communicated before 14:00 on the same day. 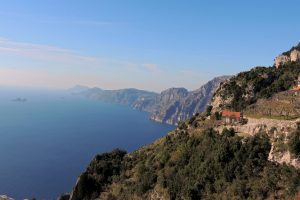 The Path of the Gods is a trek of medium difficulty, 8.6 km long, which allows you to walk to Positano starting from Bomerano di Agerola in about 5h. Along the first 5.2 km (from Bomerano to Nocelle) the trek is along a dirt mule track, with continuous ups and downs on stone and rock steps in some very exposed and challenging sections. The difference in level downhill is 793 metres, the uphill one 184 metres. This is therefore a trek that requires an very high level of fitness and is suitable only for people accustomed to walking in the mountains, equipped with trekking shoes and suitable clothing. Also you need a hat and at least a litre of water each as the path is completely in the sun and there is no shade. The appointment is at 9:15 am in Bomerano di Agerola, in Piazza Paolo Capasso, near the public fountain. During the walk there will be a short break to allow you to have a packed breakfast, which can be purchased in Piazza Capasso where there are various delicatessens selling local products. From Nocelle the tired ones can reach the centre of Positano by bus, thus reducing the trek by 3.1 km and thus avoiding the steep steps with 437 metres of difference in level that from Montepertuso reaches Positano. Reservations must be communicated by 22:00 on the previous day. This is a medium-low difficulty trek of 6.4 km, which follows a 3.2 km trail (outward and return journey) and consists of a steep stone staircase and then an unpaved mule track. The difference in height is 309 meters both uphill and downhill. There are no exposed stretches. However this is a trek that requires good fitness, suitable for people used to mountain walking and equipped with trekking shoes and appropriate clothing. The appointment is at 9:30 am in Piazza Duomo in Amalfi, at the foot of the Cathedral’s steps. The return is scheduled for lunch time. All reservations must be communicated the day before. The guided tour of Amalfi is a guided tour of about 2 hours on foot, along a path of about 1 km that crosses the historic city centre and its main monuments. The meeting is at 17:00 at the entrance of the Arsenale della Repubblica (10 metres to the left of the ceramic panel of Porta della Marina). During the tour there will be a visit to the Cathedral, whose you pay the entrance fee. Reservations must be communicated within 4.30 pm the same day. Are you already feeling active and excited about your vacation in Amalfi and neighbourhoods? Start now planning your activities and book your stay taking advantage of our sporty offer.